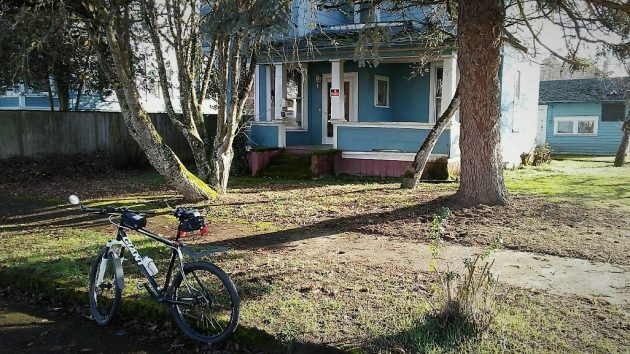 » What’ll happen with this old house? What’ll happen with this old house? There’s talk of “rehabilitation” of this historic house at Fourth and Maple in Albany. I took photos of 732 S.W. Fourth Ave. in December, thinking what happens to this vacant house might illustrate Albany issues such as historic preservation and code enforcement. The Albany Landmarks Advisory Commission, which must approve exterior alterations on historic buildings, has struggled in two recent cases with whether associated garages are “historic” and therefore need a permit to be demolished before they can be replaced with new garages. 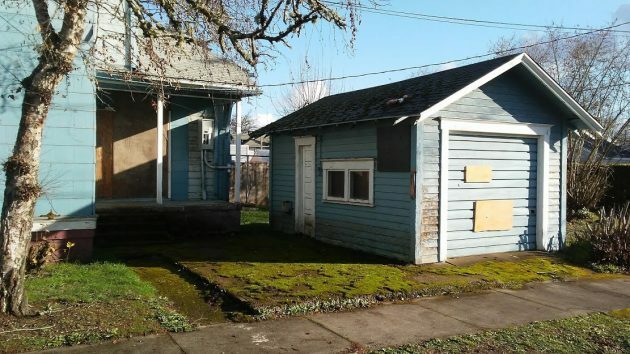 In the most recent case the commission last week approved, by a vote of 4-3 following a discussion of an hour and a half, the replacement of a small garage with a two-story garage and accessory dwelling at 828 S.W. Calapooia St. Bill Ryals, the panel’s chair, says the historic status, if any, of associated garages needs to be clarified in Albany codes. There are lots of those, he says, and owners may want to replace many of them with accessory dwellings. The property on Fourth Avenue has been vacant for some time and is posted against trespassing. 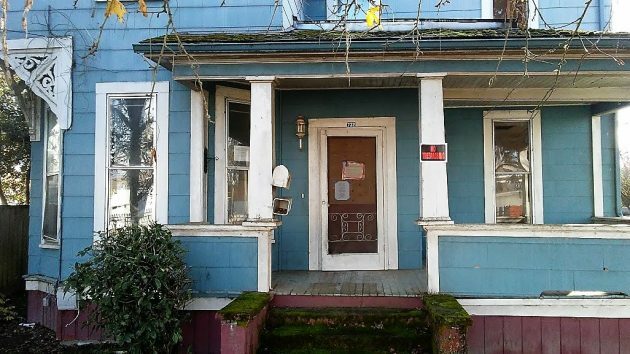 It is one of the houses listed in a report the city council will get on Wednesday about efforts by Code Enforcement Officer Kris Schendel and others to clean up derelict properties. The city had the place cleaned of junk and overgrown bushes in 2017. But the vegetation grew back, and the garage attracted squatters, the council report says, so the city assessed “daily fines” and moved to foreclose. The city says Fannie Mae, the Federal National Mortgage Association, bought the property at a sheriff’s action on Jan. 11. Presumably Fannie Mae took the property back, because it was the owner in December too, though somehow an outfit called Reverse Mortgage Solutions of Houston was involved too. Signs were posted on the porch and front door on Dec. 27, 2018. The garage is listed as an “associated building” at the “historic contributing” house. Is it historic too? Didn’t you also report on another property on 4th street that a local farmer was fixing up. How is that project coming. Look for an update on that project in the coming weeks. Nothing screams out, “historically significant” like that garage. The tilted, rotting porch simply reeks of historical significance. The 1950s-looking garage only adds to the ambiance. We live close to this house and it has been a thorn in our neighborhoods side for a decade. I was at the November auction and I turned out to be the only one interested in it. The powers that be, decided to cancel the auction. At the time, I was told by the city attorney that the back taxes and penalties were into six figures and anyone purchasing the home would be responsible for that. Not a great incentive for a investor. I would love to see something done to improve this house and so many others in Albany that are in similar condition. European cities thrived because throughout history they were not afraid of discarding buildings that were not relevant, nor useful. Calvono’s observations make common sense – sorely lacking these days. Buildings grow sacred as society grows more stultified. At the current pace it won’t be long before Walmart will be forced to petition some preservation board in order to change the store’s historical appearance. The Mayor/Council iron grip tightens. Great point. Museums with pics provide a look back. The idea that certain parts of town or certain properties need to be preserved as museum pieces in-place is a terrible waste of taxpayer monies. Good job HH on the accuracy of your investigation. This was my mother in laws house, she did a reverse mortgage. They wanted her out after she was paid off and here it sits. The reverse Morgage people did nothing to encourage her to pay it back they got exorbitant insurance so they would get that as income. We thought they would flip it when we moved her out. The Reverse Mortgage folks are eating this one.